These are amazing pancakes! You only need one banana, and we always have bananas. Have you ever had a chocolate pancake before? You are in for a treat! Your kids will go crazy for these! Make a whole batch and freeze them! These are so great for a quick breakfast on the go! Slice a fresh banana on top and you have a delicious breakfast! 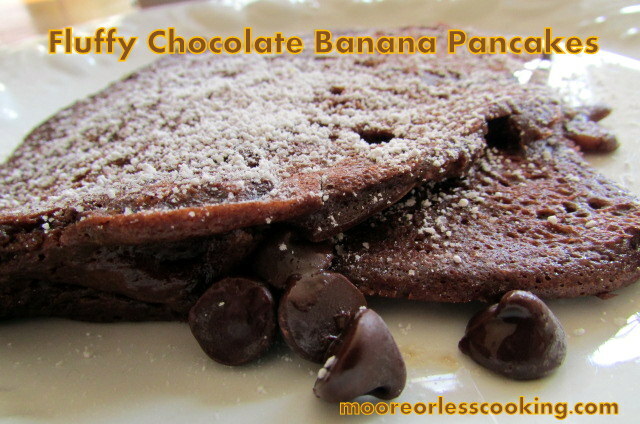 These Fluffy Chocolate Banana Pancakes are out of this world yummy! If you haven't given chocolate pancakes a try, what are you waiting for?? Mix in buttermilk, egg, vanilla and vegetable oil until well combined. Pour the wet ingredients into dry ingredients and mix until just combined. The mixture should still be pretty lumpy. Spray a large pan with nonstick cooking spray and set to medium heat. Cook pancakes until bubbles form on the surface and edges are just cooked, about 2 minutes. Flip and cook for an additional minute. Oh MY!!!! My boys would love to wake up to a batch of these!!! Great recipe! These pancakes look delicious! I have pinned and shared on my page. Yummy! Gotta make these for my grandkids next time I visit! Love!!! These chocolate pancakes look fantastic Nettie. Pinned! These pancakes look delicious! I love the banana-chocolate combo!